Nottingham Food Lovers: The Bowman Hucknall- Where's My Flaming Pulled Pork? The Bowman Hucknall- Where's My Flaming Pulled Pork? Sometimes you get an offer of a bite to eat out and think "There's no need to bother with the food blog tonight". This evening was supposed to be one of those occasions when my dad offered an impromptu opportunity to catch up without the need to cook. We headed down to the Bowman on the outskirts of Hucknall as it's a little bit quicker than a drive up to Mapperley Top or Arnold from mine and we fancied a change. It's ages since I went in the Bowman but having cycled past plenty of times. Ordering a Pulled Pork Burger I thought I'd get a generous serving of Pulled Pork but this arrived. After raising the issue with a member of staff I was told that I had been served "A Portion" to which I was rather shocked. If that's how much Flamming Grills class as a portion of Pulled Pork they really should be calling the item something different and not having Pulled Pork as the lead in the description. I was shocked! The member of staff did go back to the kitchen to get me some more but in my eyes the damage had already been done. If that's a serving I certainly won't be returning to the Bowman anytime soon. 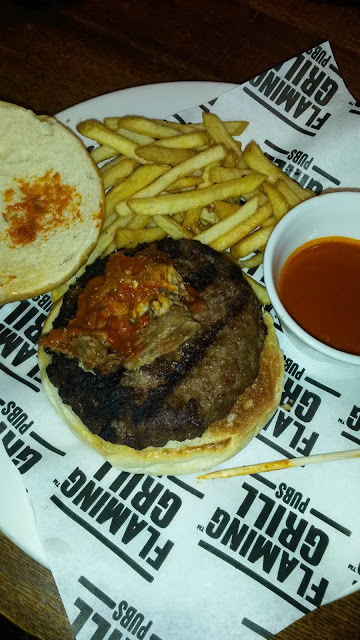 In terms of a review the burger itself was rather nice with a lovely toasted brioche bun however the Pulled Pork, despite being in a slightly spicy sauce was dry and very tough. I defintely can't recommend a trip to a Flaming Grill on last night's evidence.